Great Neck Plaza is a village in the town of North Hempstead in Nassau County, New York, in the United States. The population was 6,707 at the 2010 census. The Village of Great Neck Plaza was incorporated on May 3, 1930. In 1866, the New York and Flushing Railroad extended their main line into Great Neck through a subsidiary called the North Shore Railroad, thus transforming it from a farming community into a commuter town. The NY&F was consolidated into the Flushing and North Side Railroad in 1869, only to be merged into the Flushing, North Shore, and Central Railroad in 1874 and leased in 1876 by the LIRR. Throughout much of the late 19th Century, Great Neck was the terminus of what is today the Port Washington Branch of the LIRR. The village was incorporated in 1930, even as the station that led to its existence was being reconstructed. In addition to the railroad station, Great Neck Plaza contains other historic structures, such as the local post office and the Grace and Thomaston Buildings. Great Neck Plaza encompasses a busy commercial district, two parks, as well as a residential section with many multiple dwellings and private homes. 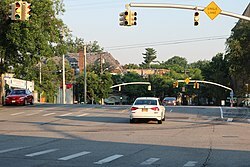 Although geographically the Village measures only a third of a square mile, it boasts a vibrant downtown including the Great Neck LIRR station, over 250 retail stores and service establishments, almost 90 multiple-family apartment buildings, 148 single family homes, approximately 40 office buildings, 2 four-star hotels, a nursing home, a senior independent living facility and one assisted-care living facility. The Village of Great Neck Plaza is protected by the Nassau County Police Department Third Precinct located in Manhasset, and fire protection is provided by two volunteer departments: Vigilant Hook & Ladder for locations north of the LIRR tracks and Manhasset–Lakeville Fire Department for locations south of the LIRR tracks. Great Neck Plaza is located at 40°47′13″N 73°43′33″W﻿ / ﻿40.787068°N 73.725775°W﻿ / 40.787068; -73.725775. According to the United States Census Bureau, the village has a total area of 0.3 square miles (0.78 km2), all of it land. As of the census of 2010, there were 6,707 people, 3,603 households, and 1,581 families residing in the village. The population density was 20,853.4 people per square mile (8,012.2/km2). There were 3,925 housing units at an average density of 12,723.4 per square mile (4,888.6/km2). The racial makeup of the village was 77.6% White, 1.5% African American, 0.05% Native American, 11.6% Asian, 0.03% Pacific Islander, 2.7% from other races, and 1.8% from two or more races. Hispanic or Latino of any race were 7.29% of the population. There were 3,603 households out of which 12.8% had children under the age of 18 living with them, 36.2% were married couples living together, 6.1% had a female householder with no husband present, and 56.1% were non-families. 51.1% of all households were made up of individuals and 23.6% had someone living alone who was 65 years of age or older. The average household size was 1.74 and the average family size was 2.54. In the village, the population was spread out with 11.6% under the age of 18, 3.9% from 18 to 24, 32.3% from 25 to 44, 22.0% from 45 to 64, and 30.3% who were 65 years of age or older. The median age was 47 years. For every 100 females, there were 75.5 males. For every 100 females age 18 and over, there were 72.0 males. The median income for a household in the village was $54,591, and the median income for a family was $70,781. Males had a median income of $51,863 versus $46,703 for females. The per capita income for the village was $42,914. About 4.1% of families and 7.1% of the population were below the poverty line, including 4.7% of those under age 18 and 12.8% of those age 65 or over. ^ a b c d e f "American FactFinder". United States Census Bureau. Archived from the original on 2013-09-11. Retrieved 2008-01-31.